The underground music world has been characteristically male dominated, both the bands and the audiences. With the upsurge of women involvement in the scene, female bands and musicians are all too often regarded as novelty acts, regularly shrugged off as militant feminist or cutely entertaining. Overwhelmed by the numbers of male bands, female bands of the scene are lumped together in one category, "girl group", regardless of style, talent or musical content. 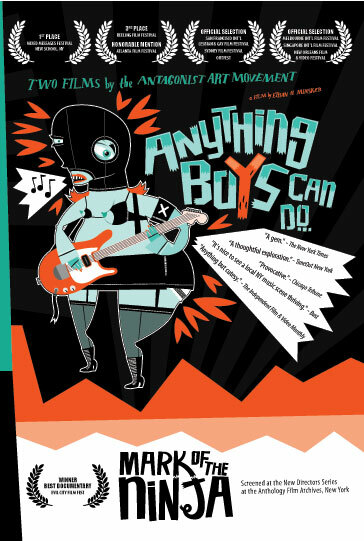 Anything Boys Can Do... investigates and reveals the issues affecting women in general and as individual performers. This documentary covers art events conducted by the Antagonist Art Movement during 2004, featuring Ted Riederer, Ethan Minsker, Brother Mike Cohen, Crispy T, Zeke Tawilerger and many more. Original score by The New You, The Great White American Rap Band and Oh Death. The New York Times - "A gem." TimeOut New York - "A thoughtful exploration." The Independent Film & Video Monthly - "Anything but cutesy." Bust - "It's nice to see a local NY music scene thriving."